The amount of information we have to manage on a daily basis is quite phenomenal. In 2010, Eric Schmidt (CEO of Google) told us that every two days, we create as much information as we did from the dawn of civilization up to 2003. We all know the amount of news and social media we receive on a daily basis. This is on top of our daily routines, where we’re meeting people, navigating traffic, completing our work and running our social lives. This is an enormous amount of information for our brains to have to deal with, and we just don’t have the time to consider all the options for every decision we need to make. “What you see is all there is”. When the brain only has partial information, it fills in the gaps itself and we’re not normally even aware it has done that. The brain grabs on to something, makes a decision, and allows us to move forward. Coping with all this Information. The brain is a very energy hungry organ and has to be as efficient as possible when making decisions. As a result, it uses shortcuts, some intrinsic and others based on previous experience, called heuristics. And sometimes, these heuristics, while they enable us to move forward, don’t come up with the rationally correct answer. They provide solutions that, when you analyse them, are not the most logical option. These heuristics are called cognitive biases. Falling prey to cognitive biases is nothing to do with being stupid or not thinking enough. 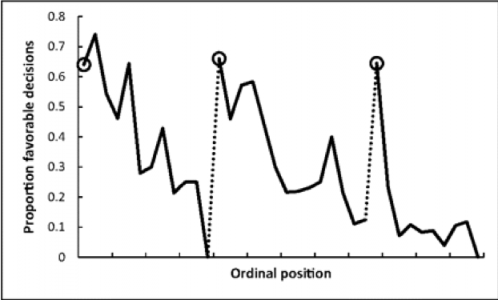 A 2010 study of parole judges showed, that when they made repeated rulings, they had an increased tendency to rule in favour of the status quo. So the more decisions they made in a day, the less and less likely people were to be given parole. This is shown in the following graph. Along the bottom is the time into the day, adjusted for the fact that the judges controlled their own timetables and up the y-axis is the proportion of favourable decisions made. These were well-educated, intelligent people who, I’m sure, believed they were making rational decisions. But the evidence showed otherwise. People who arrived in the court early in the day were likely to get parole while people who arrived towards the end of the day were unlikely to get it. What this also showed was that after lunch and rest breaks this trend reversed somewhat. The break restored their cognitive function. 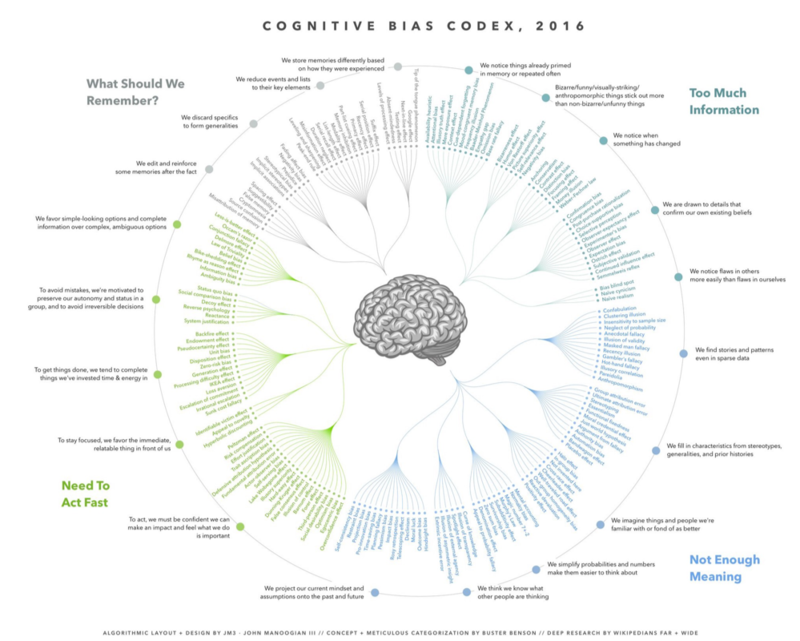 Where do Cognitive Biases affect us? As project and programme managers, we work on long-term, often strategic, projects. It is important that decisions we make in those projects are rational, rather than instinctive to deliver the maximum value to our organisation. This is why we, in our roles, need to be aware of cognitive biases and how they impact us. And they will impact us because cognitive biases are all about how people think. 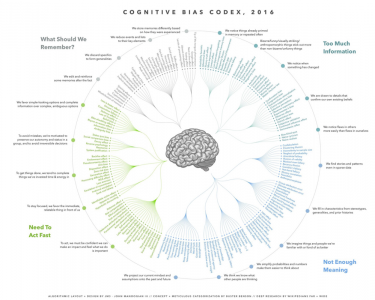 Around 200 cognitive biases have currently been identified. To make them easier to digest they have been categorised in a variety of ways by a number of people. The cognitive bias codex (Buster Benson & John Manoogian III), is one of these. In this model, they fall into four main categories. Cognitive biases that we use with when we have too much information. We need to filter out as much information as we can. So we home in on things that have changed or stick out, or maybe find something that matches what we already believe. Those we use because there’s just not enough meaning and we need to fill in the gaps in our knowledge. We imagine that things and people we like or familiar with are better than things that we don’t. We simplify probabilities and numbers to make them easier to think about, and we believe that other people think like us, so we know what they want without needing to ask them. Biases that kick in when we need to act quickly. Often, we go for the thing that’s right in front of us. Or we carry on with what we’ve already started as we like to complete things we’ve already invested time and energy in. We do what we feel is important as it makes us feel good. The cognitive biases we use when we are dealing with a lot of information and we don’t know what we should remember and take forward. Then, we generalise and discard details. We reduce things to their key elements. Everything that the brain sees or hears or touches has multiple interpretations, and the one that’s chosen is the brain’s best guess at interpreting what flows into it. So what can we do about cognitive biases in our work? One of the things we can do is break people out of their standard ways of thinking. There are very many workshop facilitation techniques that help people approach problems in new and different ways, and ideally come out with logically thought through conclusions, rather than just going for the status quo. As the parole judges mentioned at the beginning of the article demonstrate, taking regular rests and food breaks help us make better quality decisions. The brain needs to recover, and slogging on through hours and hours of meetings is rarely productive. Giving people time to rest and have a break helps them make better quality decisions. Cognitive biases kick in when we need to act fast, so we need to ask ourselves “Do I need to act fast? Does a decision need to be made right this second? Can I sleep on it? Can I go for a walk round the office and grab a coffee?” Talking things through with people also helps. Saying something out loud slows our thought processes down and explaining it to other people makes us think it through again. Other people may come at a problem from a different perspective and provide new insight. Cognitive biases affect everyone and can catch us all unawares. Developing strategies to minimise their effects helps everyone make better quality decisions, and avoids some of the pitfalls they bring. To find out more about Cognitive Biases I recommend this book. This entry was posted in Cognitive Biases, Psychology. Bookmark the permalink.